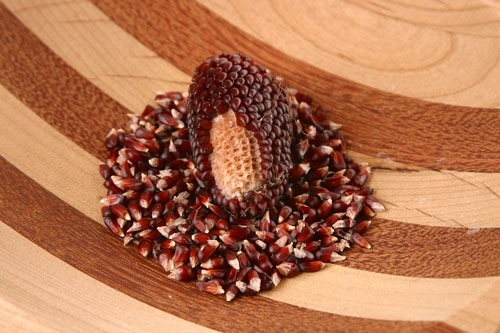 This has to be my favorite find from the farmer’s market–purple popcorn that is still on the cob. 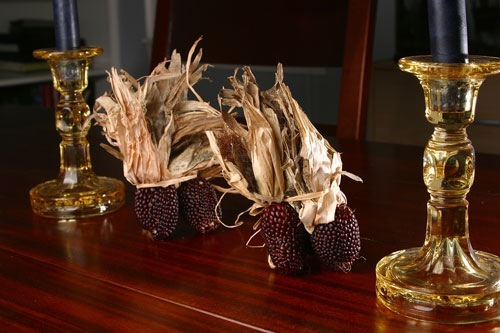 The cobs were miniature and bunched together so they made for a nice little decoration on our table. After a couple months of serving as decoration, it was time for the corn to serve its true purpose…as a crunchy, salty snack! It was pretty easy to de-kernel (is that the right word?) 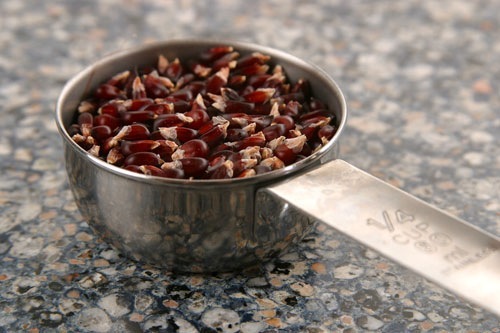 the cobs; you can pry the kernels off using the palm of your hand. If the kernels are prickly, use a pair of gloves. Cook the kernels the same way you would regular popcorn. 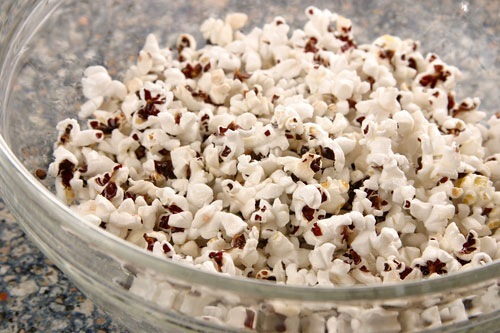 Go here for the best way to cook popcorn–on the stove! The kernels were a lot smaller than standard popcorn and they popped up smaller too. I am not sure if they really tasted different, but they looked cool because the inside of the popcorn was purple. The purple and the blue popcorn is really really good. The purple they say in high in antioxidants and the blue they say is just a little bit sweeter! I personally prefer the purple. I do have to say, I’d rather have blue or purple over white or yellow….yummy either way! gee i hope someone can answer this… i have a bag of yellow popcorn kernels, is there anyway to plump them up and eat them like soft corn (you know, the food type)? or are these kernels only poppable? like, what would happen if i boiled them, or left them in water for 3 days, i’d like to see if i can eat them like corn! is popcorn just old fresh corn? It doesnt look much different than yellow corn once its popped. My mom got some cool blue corn that she’s been waiting to pop. I was wondering what it would look like! Now I know. Did it taste any different? You can REALLY do this??? purple popcorn haha! these are cool. love popcorn any form they come. It’s so pretty intact I would want to use it as a table centrepiece before I popped it. I love that purple color! would definitely want to give it a try. I don’t trust any popcorn that isn’t yellow. White popcorn thinks it’s better than yellow, and that just doesn’t sit right with me. A friend popped some. We sat and ate it while we talked. It was popped in a heavy bottom pan with olive oil and salted with sea salt. …Wonderful! And, the popcorn flavor that real popcorn lovers love “was poppin”. It is still basic, unpretenious, homemade popcorn regardless of what FatB said.